The summer season is here, which means that you can finally have fun under the sun. Swim at the pool, take road trips to the beach, or relax on your outdoor deck. You may be wondering how you can soak up the sun and enjoy summer if your outdoor deck is in shambles. 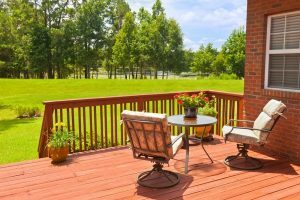 Well, there are a lot of things that can destroy the look and quality of your outdoor deck but, fortunately, there are many ways to protect your outdoor deck against them. Here’s what you should know about what can destroy your outdoor deck and how to fight against them so you can keep your outdoor deck looking as good as new all summer long. Weather is the most common factor that can ruin the look and quality of an outdoor deck, especially if the outdoor deck is made of wood. Sometimes excessive exposure to sunshine can dry and harden your deck, not making it as nice and smooth as you’d prefer. Additionally, rain can ruin your deck completely since water is detrimental to the quality of wood, which is the material of which most outdoor decks are made. Your deck should be pressure washed every year, or more frequently if you see water stains or mildew stains as a result of excessive rainwater. This is the best way to prevent water seepage or the acidic elements in rain from deteriorating the wood in your deck. Another way to protect your outdoor deck against prolonged exposure to sun or rainwater is by decorating it with mats and rugs, especially recycled plastic rugs since they don’t retain moisture. Pressure-washing your deck is also a great way to better protect it against other common problems that can harm your deck, like bugs and mold and mildew infestations. The other most common, and probably the most destructive, factor that can harm your outdoor deck is insects. Whether it’s an infestation of pesky, wood-devouring termites or a nasty hive of wasps, bugs can make themselves unwelcome guests in your outdoor deck, reducing your nice and pristine outdoor deck to shambles and making it difficult to enjoy relaxing on your deck with creepy-crawlies and all of the annoying buzzing sounds. If your deck is made of wood, one way to protect it against termites and other insects is to treat the wooden surface with certain bug-repellent chemicals. These will kill any termites or other insects nesting in your wood and prevent any more from taking refuge for a long period of time. Also, although this can be a costlier option, replacing the wood in your deck with special types of lumber like heartwood, redwood, or western red cedar can help prevent bugs from invading and ruining your deck. These types of wood are resistant to termites thanks to their naturally high amount of chemical compounds called tannins. The last, most common (but probably the most disgusting) factor that can ruin your outdoor deck involves mold, mildew, and other bacterial growths. Discoloration and deterioration of your outdoor deck thanks to mold, mildew, and bacteria can be a direct result of the damaging effects of harsh weather conditions like excessive rain. Moisture from excessive rainwater building up in the wood materials of your outdoor deck creates an ideal environment for bacterial growths like mold and mildew, which can not only be harmful to your outdoor deck but also the health of you and your family – preventing you from enjoying the dog days of summer on your lawn chair or by your grill without potentially getting you sick. Like with protecting your outdoor deck against bugs, depending on the materials your deck is made of (wood, brick, or marble), applying special protective chemical coatings to the surfaces of your deck can help reduce or shield your deck against bacterial growths like mold and mildew. There are also other methods for eradicating mold and mildew from your outdoor deck that usually require the assistance of professionals. Flortec Hardwood offers great services for outdoor decks that are discolored because of mold and mildew. These services include full deck plank sanding, deck staining, and even total board replacement if the damage is severe enough. Also, certain special types of wood like heartwood, redwood, and western red cedar are as bacteria-resistant as they are bug-resistant.